I know I have reviewed the FiiO E10 on this site before but I felt that since I really liked those when it came out that I should review the latest version as well. I don’t know what FiiO did to the first update to the E10 with the first Olympus model since I missed that one, but after listening to the latest version or the E10k, I can say that they have got themselves another winner. Before talking about the sound, let’s talk about the unboxing and setup. Opening the box, what you get is the E10k unit itself, the USB cord and some rubber feet which I automatically stuck on to the unit as soon as I saw them. Just like the older model, setup was very easy and pain-free. Just plug it into any free USB port and it works automatically with files up to 24bits and 96khz sampling rates. No installation of drivers is needed. 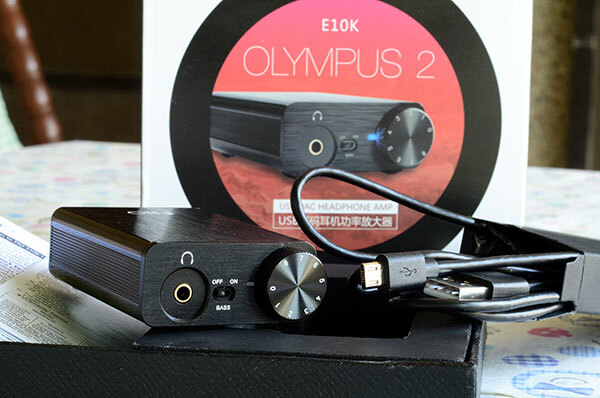 Just like the old E10, the E10k Olympus 2 also comes with a bass boost and a gain switch as well as a line out jack and a coaxial digital pass through in case you want to convert the USB from the computer to a standard coaxial digital output. The build quality of the E10k seems about the same as the old version with only some changes in the looks due to the different placement of the bass boost and gain switches. The key component difference between the older E10 and the newer E10k lies in the switch from the older warmer and musical WM8740 chip to the newer cleaner and less noisy PCM-5102 DAC chip used by the likes of Arcam. In general, FiiO has been quietly moving away from the WM8740 chip which was their stock chip and house sound for the first few years. 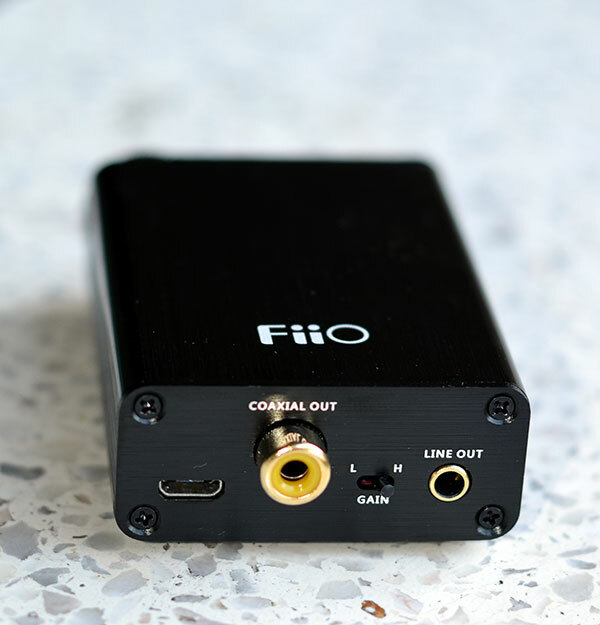 The FiiO E18 and the X5 (also a switch to PCM) are two other examples where FiiO have ventured into new sounds and implementations and a sure sign of a company continually growing in confidence.The second key change is the amplification stage with a switch to the LMH6643 opamp over the older AD8397 which for me produces a more natural response with superior imaging. They do have a little less slam than the AD8397 but come across as smoother and more refined. Now let’s get to the good part of the review. Let’s talk about the sound of the thing. I was first impressed by the original E10 for its great bang for the buck factor even though it may have lacked some technical prowess over more expensive DAC/amps but with the E10K Olympus 2, FiiO has managed to improve on the E10 successfully by adding more extension to the highs and better dynamics without losing the musicality of the old version. I don’t have the old E10 with me anymore to compare them side by side, but the new version seems to be less bloated in the midbass region and more accurate in its tone on top of the more extended treble reproduction. I would think that with all these improvements, the price would increase as well but lo and behold, FiiO has decided to keep these guys priced the same as the old ones. Bottom line is that if one wants a DAC/amp “on the cheap” meaning the sub 100 dollar range to use with a computer via USB then I can’t think of a better sounding all in one device than this. In fact, I have owned many higher end units at thrice the price or more that can’t even touch the natural tonality that these FiiO’s can give. I have however found another highly popular amp that I have stuck with for a long time due to its great value which is better sounding to me than the E10K Olympus 2. This amp that I speak of is the JDSLabs O2 which I am currently using with a Schiit Modi DAC. FYI cables used are the AudioQuest tower for the interconnect cables and Schiits own Pyst USB wire for the computer to DAC end. I say the sound is better because I feel that the Modi/O2 combo is better than the E10K Olympus 2 when it comes to the technical aspects of the sound. The Modi/O2 just has a tighter sound with more tactile sounding instruments without breakup. The E10K in a direct comparison sounds like a portable while the Modi/O2 combo sounds more like a desktop in its dynamics due to the fact that it just sounds less strained without giving as much of a hint in softening transients as much as the e10 does. Don’t get me wrong, the E10K has a very good amp for sensitive headphones like the Audio Technica M50 that I have on my head right now but it still doesn’t have that extra jump factor that the Modi/O2 starts to have that makes one feel that they are getting a taste of the higher end rigs. It is sort of like comparing a 320kbps mp3 file vs the original cd that it was ripped from. The original will always be slightly better than the lossy file but sometimes the difference is too small to matter. The Schiit Modi/JDS labs O2 combo with the cables I have is around $300 vs the 75 to 80 dollar price of the e10 so it is not really comparing apples to apples. I don’t think the differences will be that big anyway for those gunning for a DAC/amp in this price range. Let’s put it this way, The Modi/O2 combo’s difference in sound vs the FiiO E10K Olympus 2 is way less than the difference between the E10K against my laptops headphone jack which is total garbage against that of the FiiOs. In case I missed anything, here is an outline of what the E10 is lacking from the more than 3x the price Modi/O2 combo with the cables I used. The E10k mids have some accessible magic due to the coherent soundstage. This will, of course, depend on headphone synergy as well and after listening to the E10k, the Modi/02 combo can sound clinical! 1. 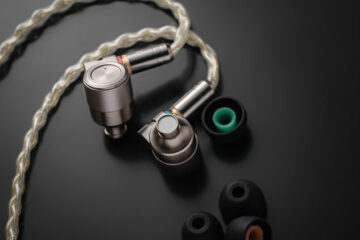 The new E10 has more extended highs and is less bloated in the midbass region. 3. The new E10 sounds snappier and less sleepy maybe due to the more extended highs. I don’t have them side by side so I’m not sure but it could just be due to a better transient response on the new model as well. 4. The new E10 has even better value for the money vs the old version. I cannot believe this is $75 and can sound this good. To stay relevant in this end of the market and still find the time to launch $300 DAP’s is really paying attention to the original budget loving audio fans that got FiiO to where they are now. The bottom line for people upgrading from a computer’s headphone jack the new E10 has great power for a very small device and is insanely better in power and volume than my Lenovo’s headphone jack. For the low price, it is a no-brainer and should be on the top of anyone’s list looking for a sub 100 dollar DAC/amp for a computer. Can please compare the DAC of both Modi and E10k? That would be great as both 24/92 capable DAC. I’m a proud owner of the old revision (E10) and I’m paring it with the SoundMagic E10 headphone, which sounds phenomenal together. The SoundMagic E10 is a quite bassy yet detailed and airy phone which I value greatly! I’ve got a question for you regarding which revision you would rate better if ones musical taste is aimed towards EDM? Mainly Soulful Drum and Bass, but also house music and other genres. You stated the new E10 has less mid-bass bloat which is a good thing because at times some tunes can get smeard together due to too much mid-bass rather than sub-bass. I’m not a analytical guy at all and just want to enjoy the music rather than picking out details. At the same time I appreciate well produced music. Would you consider the E10K an upgrade over the original E10 if one is an avid EDM-listener? 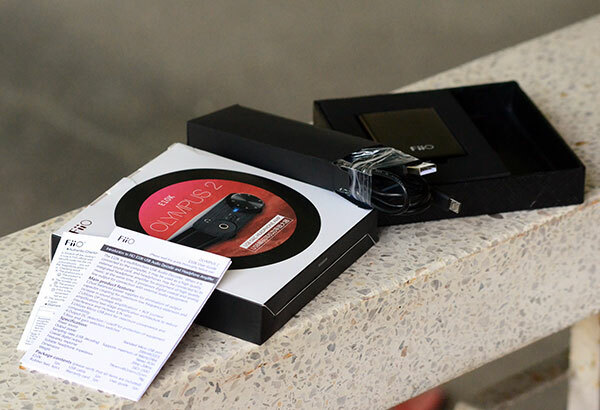 I recently bought an O2 from a local JDS distributor so I can experiment with different DACs. At the moment, with what is locally available, I am trying to decide between ALO’s The Key and the ODAC. 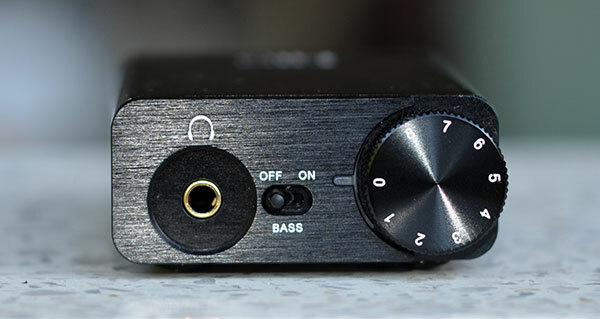 Looking at the pictures in this review, am I correct that the line-out is for using the E10K simply as DAC? If so, how does this compare with the DAC side of the E07K? I do enjoy the E09K+E07K with my Grado and HD518. But I prefer my X3 as DAC on both the E09K & the O2 when I am using my HD600. 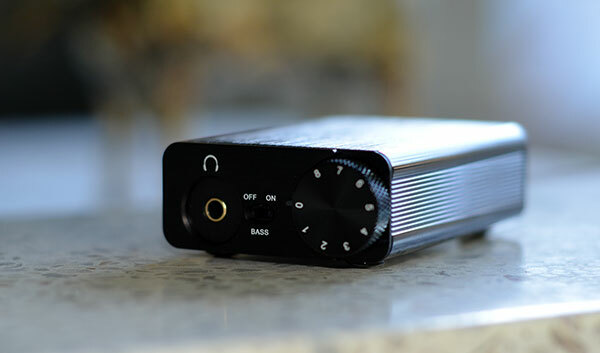 To summarize the question, can any budget DAC really make a wide-smile of a difference in bringing out the most out of budget SS desktop amps? How does it compare to current crop of $200 thumbdrive size DACs? I hope to get the E10k at the end of August and compare it to the Microstreamer. Hopefully the E10k will be better than the E07k that I have now. Both use the same headphone opamp buffer. Great review! Do you think the E10k could drive a T1 to decent volume levels? 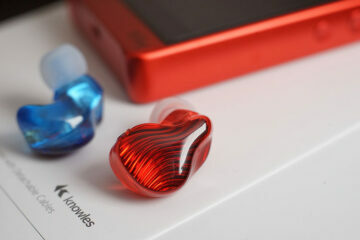 That depends on your definition of enough volume but specwise, they are only rated to drive 16 to 150 ohm headphones. Good to know. Still good at the price.